Only a little Sugar-Coated: Wicked!!! I love the music. I love the humor. I love the story. As l I was watching the cast take bows, I realized the stars of the show are both female. Although there is romance in the story, the romance is not THE story. I like that. The whole play is about why they called the wicked witch Wicked. She wasn't, but it served the "other side" to have a villain. She saw injustices. She wanted to help the Animals. The wizard was the one hurting the Animals. He wanted her power, but when she wouldn't give it to him, he made her into the villain. The whole land of Oz united under the wizard to hunt down the wicked one. I thought of how it felt leaving the church. They call those of us that leave apostates, anti-mormon, angry, bitter, and often even evil or wicked. What if instead of villainizing people, they listened to what they had to say? Couldn't they then make changes that make them into a better organization? I thought of all of the politicking that goes on. It's ALL about "us" vs. "them". I feel frustrated trying to learn about Obamacare, because there are two sides that are both very extreme. Neither one makes sense. (It will not save the country, and it will not end the country.) I feel frustrated with the elections, because the politicians are ALL trying to get people to like them so they can gain power. All of them believe they can help and serve the country. None of them are "all good" or "all bad", but they all want you to believe "I am good. My opponent is bad." WIZARD: See - I never had a family of my own. So, I guess I just - wanted to give the citizens of Oz everything. WIZARD (spoken) Elphaba, where I'm from, we believe all sorts of things that aren't true. We call it - "history." People ARE more comfortable believing that everything is either good or bad. Right or wrong. But that is NOT reality. It's all just an unhealthy game of pretend. Reality is, "It's not good. It's not bad. It just IS." 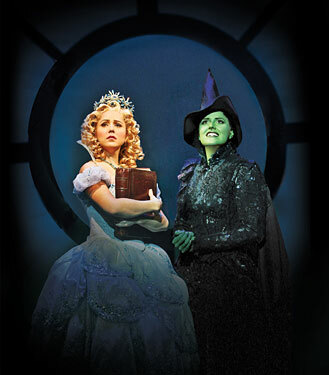 Defying Gravity is one of my favorite songs. I have loved the lyrics for a long time. Glinda tells her she can still have all the things she wanted, but she doesn't want it anymore. She has seen "behind the curtain", and it changed her. Even if she wanted to, she can't go back to being the person she was. That felt familiar. I don't want what I used to want, because I have been changed. I LOVE these lines. It's "too late to go back to sleep", so I'll trust my instincts. Amazing things happen when you can just trust your instincts. Well, if that's love It comes at much too high a cost!" I have repeated these lines to myself over and over and over. I'm not going to pretend to be someone I'm not, just so that people will love me. "If that's love, it comes at much too high a cost!" And realizing that if the only kind of love I can have from people comes if I am pretending or pandering to them, I've already lost love, because that isn't love. I loved watching the process that Elphaba goes through as well as the process that Glinda goes through. The whole show was amazing. I loved the company I was with. SO grateful I got to go! I'm so jealous that you got to see Wicked. I have every since I saw it on the Tony awards however many years ago. You are right. Things aren't black and white and society tends to want it to be that way. However as we have had the opportunity to learn (and hear over and over and over again) things aren't that simple. That sounds awesome, I'd love to see Wicked. I've never listened to the Wicked music before...well, when Justin's been singing, but I've never listened to the words and I don't really know what the story's about. But I've been listening and paying attention to the words. I really like this song. Thanks for sharing it. Those lyrics are powerful. Also, I'm glad that you enjoyed it. It's been a long time coming. Love the line "If I'm flying solo, at least I'm flying free." It can relate to so many things- church, eating disorder, addiction, bad relationships, etc. Oh yes. I like that line too. It was pretty powerful for me a few years ago. In the beginning of recovery, I was so afraid of being alone. SO afraid people wouldn't want to be with me, the real me, and I was terrified. Flying free sounded like a dream that could never happen. I really liked that article. I think the quote I agreed with the most was in the last paragraph, "In the end, it’s a word that says more about the helplessness of the accuser than it does the transgressor." Evil is the word used to describe and explain something that doesn't make sense. It helps give some sense to the senseless. I love your blog. It always has a way of getting my brain going. Not too long ago I realized that good and bad are just labels that are more opinionated than fact. I stopped believing in them. There had to be a good and bad though, and this led me to what I currently see as good and bad. Things that are good are things in balance. Bad things are always caused by corruption and/or extremism. I think this applies to evil as well. Any act can be placed into one of these categories. When I think of all of the evil/bad/wicked/wrong/mean/hurtful things that have been done to me, the only explanation for these things is that there was a corrupt or extreme goal of the perpetrator, or they were performing a corrupt ore extreme act. Whenever I think of the good things that occurred in my life, I see them fitting nicely in a balanced world. This can be applied to politics, but I am not going to go there because political issues tend to be polarized (sometimes to an extreme). I agree with you that good and bad are generally just opinions, not facts. I prefer chocolate ice cream, but that doesn't make it good. I don't like huckleberry ice cream, but that doesn't make it bad. I'm not sure I understand what you mean by good being in balance and bad being extreme. Is there such a thing as extreme good? And if good things fit into a balanced world, then wouldn't the bad just be part of the balance? Most of the "bad" things in my life didn't come from a person that wanted to hurt me - most of the time they believed they were helping me. Balance is good. Good is not balance though. Good things are a result of balance, because balance is good. Extreme and corrupt are bad. Bad is not extreme or corrupt. Bad things are the result of an extreme and/or corruption. The concept of an extreme good is more just a figure of speech. If something was really extremely good it would usually cause bad things. Sugar is a simple example of this. Charity can be a complex example of this. I truncated what I was writing about because sometimes I think faster than I can type. Sorry about the confusion. I am going to try and complete the thought now. All in all, I don't see most people as good or bad. We are humans, and we make mistakes. Some of us are allowed to convince ourselves that our actions are justified though. When this happens, these individuals become more and more corrupt and/or more and more extreme. This usually leads to things like what happened in Aurora, and 9/11, and many other instances. As a society we should have a common set of morals which prevent people from committing actions that lead up to further extremes. Unfortunately this is not always possible. There has to be solutions for when something becomes corrupt or an extreme. Unfortunately the only solution to these things, historically speaking, are other extremes. WWII, India's independence, the Cold War are just a few examples. I mentioned politics in my previous comment. The reason for that is because it is the best modern example of extremes and corruption. Each political party picks sides on a topic, and then polarizes the people to choose a side as well. The reality is that most people dont side entirely with one political part based upon just the agenda the political part has followed. I myself am pro-choice. However if I did get a girl pregnant, I would want her to keep it. I have also tried to talk three women out of having an abortion. I know this may seem hypocritical, but my reasoning for being pro-choice is that forcing a person to do something that has little bearing on oneself is a form of corruption in my mind. I have applied this system to all of the polarized ideas sold by each political party, and went with the one that is the most beneficial to human kind in the long term. Wow, I wrote a lot. Sorry, I will write smaller replies in the future. I loved being able to go see it with you sis! For me, I've often thought of "evil" as more or less attempting to control or improve yourself or your surroundings through actions that limit, impede, destroy, or disable someones ability to improve themselves internally. By being a person that seeks to take away or limit other people's abilities and freedoms that's where the line is crossed. Philosophically, Theoretically, Morally, and in Scriptural senses that is still where it is defined. In Hammurabi's Code, the most ancient of laws, that is where the law is laid, when someone attempts to limit or take someone else's ability to improve themselves, either by seeking virtues or financial gain. I like that definition. I pretty much agree with it. However, that does make a lot of people who believe they are good, evil. I defined that kind of controlling and manipulative behavior as abusive. And I write about abusive behavior a lot. I have a hard time calling it evil, only because the word evil has such harsh connotations. Did you read the article dad posted? It's really good. It talks about what happens when we call someone or something evil. We then easily dismiss them. So glad you liked Wicked, kinda wish I could have gone with you but am so glad you both loved it so much. There are so many things that could be paralleled to the story. Even though sometimes I have been known to say some people are evil, I don't really believe they are, but there have been some who let evil overtake them and then it is hard to distinguish between the doer and the deed. Good thoughts, lots to think about. It was AWESOME! It would have been even more awesome if you were there too. Maybe we need to all see it together in the future? AND I love you! Thanks for making Wicked happen for me!